We ALL have been conditioned by tradition and we often believe and do things that we don’t understand. Don't let your ignorance, arrogance, religion or traditions stop you from learning the truth! Its time people STOP cheating on the Heavenly Father and begin being faithful to him! All evil needs to prov-ail is for a good person to do nothing! for the Heavenly Father (like we are instructed to do), this WILL hit home! "I'm glad that Christian parents let their children worship the devil at least one night out of the year." This is one pagan Holiday almost EVERYONE (Christians included) know is deeply rooted in evil and satanic paganism, yet churches and Christians ALL over the globe care less. Historical study and research proves over and over again that "Samhain" or "Sow-ain" (the name changed over the years to Halloween) is as pagan and satanic as it gets! Families take trips to haunted houses, to Disneyland's themed Halloween park, to creepy corn mazes, and to churches truck on treat celebrations, all in the name of FUN. What good is it to compromise the truth and obedience of YaHuWaH's word to take part in satanic sin for a season (ABaRiY 11:25 "Hebrews")! For those who love the Creator (and his son) with all your heart and are living the set apart life, let us proudly declare to the world that we WILL NOT commit spiritual adultery against the creator YaHuWaH. Why, simply because we truly love him! Historical research prove that on Halloween evening satanists celebrate the birth of Satan (which in Hebrew, means adversary). Sadly on this wicked evening, Christian families around the world invite the spirit of Satan into their cities, their neighborhoods, their pagan parties with friends and strangers, their front lawns, their front doors, IN their homes, and even into their children and themselves. The children dress up (along with the adults because they love the lie) for this sadistic, day (Satan's birthday party), to be someone they unknowingly really ARE! Each year on Halloween people (Christians included) spend hundreds of dollars to create elaborate decorations for this wicked celebration, NOT only to out due their neighbors for Satan and for themselves. Furthermore, each year people practice and reinforce learned behaviors for children and families to continue the cycle of sin for every generation. The evil travels door to door, and community to community, all over the city, spreading its reinforcements of vain traditions, like a contagion of with the agenda of snuffing out the light inside the people, due to their ignorance, willful or otherwise. 2 Ye shall not add unto the word which I command you, neither shall ye diminish ought from it, that ye may keep the commandments of YHWH your ALaHiYM which I command you. 19 And if any man shall take away from the words of the book of this prophecy, ALaHiYM shall take away his part out of the book of life, and out of the holy city, and from the things which are written in this book. For all those who say that the Creator looks at the heart, YES he does! The question YOU need to ask yourself is "Does he like what he see's?" All of us in the truth would like for ANYONE to please show us in scripture (Chapter and verse) where it says "Its ALL ABOUT our heart!" Halloween (contraction of All Hallows’ Eve) is a holiday observed on October 31, the evening before All Saints’ (or All Hallows’) Day. The celebration marks the day before the Western, pagan Christian feast of All Saints and initiates the season of "All hallow tide", which lasts three days and concludes with ALL SOUL'S DAY. In much of Europe and most of North America, observance of Halloween is largely nonreligious. 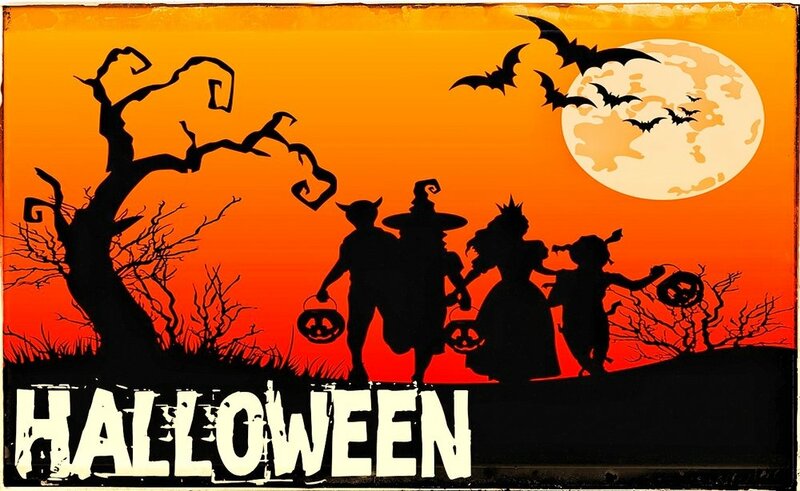 Halloween had its origins in the festival of Samhain among the Celts of ancient Britain and Ireland. On the day corresponding to November 1 on contemporary calendars, the new year was believed to begin. Halloween had its origins in the festival of Samhain among the Celts of ancient Britain and Ireland. Some of the events on and before Halloween include child / adult kidnapping, sadistic sacrifices of adults / children, animal sacrifices (dogs and cats go missing) and portal opening activities. In addition, Halloween perpetuates an identity crises in both children and adults, which is the goal of Halloween, according to the ex-satanist. Halloween, further opens doors for spiritual possessions and includes activities for the express purpose of conjuring up spirits. Witches and satanists are in full operation on this night, and in the time leading up to this event. Wiccans even curse the candy at the stores, which will be then purchased and given out on the satanic days leading up to and on Halloween. Ultimately, Halloween esteems death and false deity pagan worship, elevating those things above the worship of YaHuWaH, but Christians justify their sin because for them its ALL about THEIR wants, THEIR fun and NOT hurting their kids feelings. Family Harvest Fest, Hallelujah Night, and Trunk or Treat is the way today's CHURCHES try to put new wine in an old tainted corrupted wine sack. The level of compromise from pastors and the flock that sits under them in these modern day churches is shameful and pitiful unto YaHuWaH. Churches and pastors will NEVER tell you that taking part in pagan holidays is cheating on YaHuWaH with Satan and that the creator HATES IT! WHY wont the pastor tell you its wrong, because 1) pastors are more concerned about getting butts in church seats then putting souls in the ShaMaH (heaven), 2) big holiday events like Halloween draws HUGE crowds which ensure HUGE money offerings and 3) the pastor and their church goers are pagan lovers and DON'T even know it! If your spouse continues to cheat on you, week after week, there comes a point where you realize that "TO THEM" your relationship is NO LONGER important or a priority. This is the same way YaHuWaH felt after giving Israel a very long season of grace to repent, but Israel LOVED the disobedient pagan lifestyle MORE than what YaHuWaH wanted. At that point YaHuWaH had NO other choice BUT to DIVORCE 10 out of the 12 tribes of Israel for their adulterous, pagan, disobedient ways. We know many people DON'T celebrate the pagan holidays because of ALL its evil, vile, blood sacrificial and sadistic origins but the truth is, NO MATTER how someone tries to justify it, YaHuWaH will ALWAYS see ANYONE who takes part in pagan holidays (in ANY shape form or fashion) as someone who is committing spiritual adultery against him! Sadly parents ALL over the globe who take part in this satanic event, are teaching their kids that cheating on the Heavenly the Father with the devil is perfectly OK, because why, THEY are proudly doing it! What people NEED to realize is that NO MATTER THEIR reason on why they take part in Halloween, their opinion DOESN'T matter to YaHuWaH. This is about HIS heart, HIS wants and NOT theirs. People have the right to choose whatever lifestyle they want in this wicked world but one thing is for certain, EVERYONE has a date with death and they WILL have to take an account before the king for what they did on earth! If its NOT in scripture we shouldn’t be adding it in! Churches NEED to wake up and STOP whoring around with Satan behind YaHuWaHs back! Churches ALL over will be doing the same thing the world is doing on October 31! Romans 12:1-2 says we are NOT to conform to the pattern of this world, but be transformed by the renewing of our minds! Now that the truth is out once again, we must begin to renew our minds daily and unlearn the centuries of lies we where all taught (conditioned by tradition)! YaHuWaH commands his people to be set apart from pagan satanic traditions, SO STOP JUSTIFYING REASONS TO DO IT!!! (1 KaFa 2:9 "Peter", YaHuWChaNaN 2:15-17, 15:19 "John") Your pastor, family or friends DO NOT have the heaven or lake of fire to put you in but YHWH does!!! The problem is that churches and pastors have conditioned the people to NO LONGER fear YaHuWaH!! The whore church DOESN’T want you to sit down with your family on Oct 31 and play the video's below, NO INSTEAD they want you to stay ignorant, stay distracted, and give honor to SaTaN (the adversary) on THIER hell night along with the rest of the masses of THIS world! We DON'T support or follow the "Back to Torah" movement, but in this particular video regarding "The Origins of Halloween", according to scripture, Mark is on point! Unlearn, Unprogram and Re-think EVERYTHING you were taught!